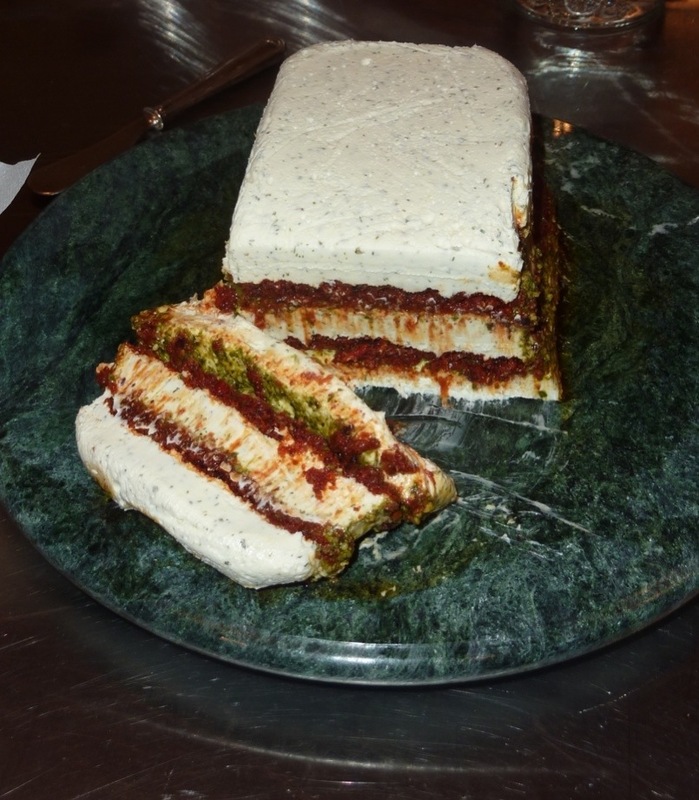 My daughter requested pesto torta (her favorite appetizer) as part of her birthday meal last week. I first tasted this pesto torta at a post-wedding family gathering in Florida a few years ago at my Aunt Jo’s house. My cousin Susan brought it as part of the antipasto table and it was devoured almost instantly. The original recipe came from Rachael Ray. I adapted it by using my own Boursin cheese and making sun-dried tomato olive tapenade instead of buying jarred tapenade. The tapenade is delicious on crostini. You may have a few tablespoons leftover. I use prepared pesto, but I find that less oil is better; a drier pesto makes for a better presentation. I used my French terrine mold that I got in Paris years ago for this and it looks great, but I have also used a souffle dish as well as an English pudding mold with good success. Serve with 6 thinly sliced baguettes. Line a terrine mold or souffle dish with plastic wrap. Place 1 cup softened Boursin cheese in the bottom and smooth out to reach all the edges. Spoon 1/2 cup tapenade over the cheese. Use a spatula to make a smooth layer. Spoon 1/3 cup pesto over the tapenade and spread to cover the pesto. Spread 1 cup Boursin over the pesto. Spread 1/2 c. tapenade over the Boursin then 1/3 cup pesto. Top with remaining Boursin. Let chill covered overnight to allow flavors to develop. Unmold 45 minutes before serving to reach spreadable consistency. Serves 12. Place all ingredients in food processor and pulse to a paste. In a food processor combine butter and cream cheese and process until smooth like mayonnaise. Add garlic and cheese. Pulse to fully incorporate. Add the remaining ingredients. Pulse until smooth and creamy. Pour into container. Place some plastic wrap over the surface so it doesn’t dry out. Cover with a lid. Bring to room temperature before serving. Serves 20. This entry was posted in Appetizers, Christmas, Pasta. Bookmark the permalink.